Outward Hound Extreme Seam Invincibles. 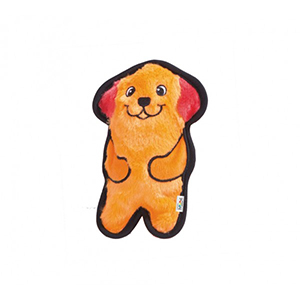 The Invincibles Extreme Seam dog toys are a fun, popular toy that is designed to withstand tough chewers longer. Furthermore, they have puncture resistant squeakers, no stuffing and 2 layers of super tough fabric. As a result, these features increase the durability of this fun-filled dog toy. As a result of containing no extra fluff and stuffing, dogs are able to shake tug and play harder with squeakers that are designed to last longer. In addition, the Invincibles features Chew Shield Technology construction and super strong seams that increases the durability of the toy. Finally, these toys are of a lightweight construction that is perfect for indoors and out. – Plus reinforced double layered seams! – Each toy comes in a variety of squeakers and in many fun characters.